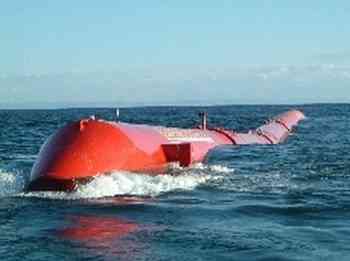 Pelamis Wave Ltd (formerly know as Ocean Power Delivery Ltd) have developed a pioneering commercial wave power generator which has been successfully installed three miles off the northern coast of Portugal near the town of Povoa de Varzim. This is the first commercial scale wave-power station in the world. Built in the Camcal factory on the Isle of Lewis, the sea snake-like device is made up of a series of three semi-submerged cylinders linked by hinged joints. Each cylinder has a diameter of 3.5 metres and is made from 700 tonnes of carbon steel. The motion of each hinge is resisted by hydraulic rams driving generators which produce electricity. The power conversion units in each 140 metre long Pelamis P-750s generates up to 750kW of electricity. Three of these wave-energy converters (snakes) have been installing giving a maximum power generation capacity of 2.25MW (enough for 1,500 homes), but if successful, a further 25 converters will be added for a capacity of 21MW (to power 15,000 homes). 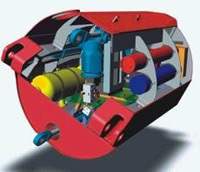 The Pelamis devices are connected to one another and then to an onshore sunstation via an undersea cable. The first phase of this project has so far cost €9 million. Portugal are attempting to generate 60% of their electricity (and 30% of all power) from renewables by 2020 * – and currently pay €0.25 per kWh (unit) of electricity generated by renewable power. Unlike wind energy, wave energy is very predictable and sustained which makes it an excellent choice. * Click here to read our related article Moura World’s Largest PV Solar Plant (in Portugal) which will soon supply enough solar electricity to supply 30,000 homes with power. Four more Pelamis machines will be installed off the west coast of the Scottish Orkney Islands at the end of 2008 in a ScottishPower 3MW project (with £4 million of funding from the Scottish government). A device which extracted all of the energy from the waves on which it swims would quickly be destroyed. Therefore, in order to survive many years, only a small portion of the available wave energy can usually be converted into electricity. Work is currently being undertaken at the University of Edinburgh to find the means to increase the efficiency of the Pelamis without reducing its survivability. 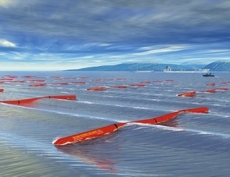 This has included research using genetic algorithms – computer programs which model the process of natural selection and evolution – to develop a Pelamis which swims on the surface in a different way depending on the speed and size of the waves passing beneath it. By developing an active control system for Pelamis, much higher outputs of electricity could be possible.